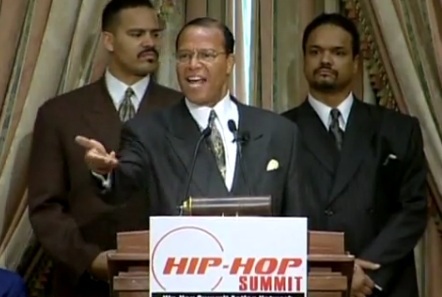 Farrakhan Claims Immortality | Stop Obama Now!! In the clip below, Farrakhan claims that he is immortal, that “He can’t die.” The Nation of Islam teaches that after the white race is destroyed, the Black Muslims will be made forever young again. Obama’s Trinity Church is an offshoot of the Nation of Islam with a similar doctrine of a millennial utopia to be created on earth after the destruction of the white man and his demonic tool of world oppression, America. According to the teachings of Elijah Muhammad, Black Muslims are supposed to improve physically as soon as they join the Nation of Islam. When the white race is destroyed, the Black Muslims are promised a permanent, glorified, new body like that of a 16 year old. Farrakhan has a need to look young and vigorous due to this prophesy. He just turned 79 years old in 2012, but has an appearance of being in his fifties, though it may be more due to hair dye and cosmetic surgery than to Allah. The Jehovah’s Witnesses have a similar concept of members living on earth forever after the Apocalypse and the Nation of Islam can be considered to be a fanatical racist offshoot of the Jehovah’s witnesses with some other, occult inputs. There is also a concept in the Nation of Islam that their actions can bring on the end times. Below is a quote (page 188) from “The Theology of Time” by Elijah Muhammad, the co-Founder and Prophet of the Nation of Islam. Elijah Muhammad was Farrakhan’s predecessor and mentor. His writings are considered to be scripture by the Black Muslims. Elijah Muhammad is referring to the other co-Founder, Fard Muhammad, when he writes about “Allah.” The NOI considers Fard Muhammad to be Allah in the flesh. This blogger added the parenthesis and highlights. To you, my beloved brothers and sisters. I’m not going to say beautiful brothers and sisters, because you can’t be beautiful until you accept Islam, that is true. The mark of the devil (white man) will remain on you until removed by Allah (Fard Muhammad) in Islam. When you accept Islam, you start getting beautiful. As we love to be beautiful, because I see you at the mirror all the time’ Come follow me sisters. You will be beautiful’ You’re going to be so beautiful until they’ll admire your shadow a mile away. Oh yes, they’re getting to be like that, which is why they don’t leave. If they weren’t becoming beautiful, they’d be going, but they’re in the process now, believing that the end will be a beautiful woman, and that’s right. Allah (Fard Muhammad) didn’t come here to make us ugly. He didn’t come here to let us remain ugly. Every one that accepts Him, He starts you to growing into a new life. That growth is a beautiful person. I’m your teacher. The Holy Qur’an teaches us that if you who turn to righteousness in this day and time, at the end of the Caucasian’s world, Allah will make you grow into a new growth. He told me about it when He was with me. He said, “No brother, we will have no ugly people. We will have no people with gray hair and bald heads.” He said, “Brother, all of our black hair will come back to us.” And the Holy Qur’an says this is done by Him blessing the righteous in growing into a new growth instead of you growing and aging up into decay, decay stop on the other side, no more decay. He told me, “‘We will look the same as we were when was 16 years old and that we’ll keep that same look, beautiful and tender as we find in David. He wanted the God to turn him back into tender age and turn him back into the energy that he had when he was in his teens. He referred to it as a young goat, so he could run leap and jump. Well all of this he proved that we would be just that. As the Holy Qur’an teaches us, that the hereafter is something to be prayed for and desired. As you move on in days, months and years, you become a different person all together.